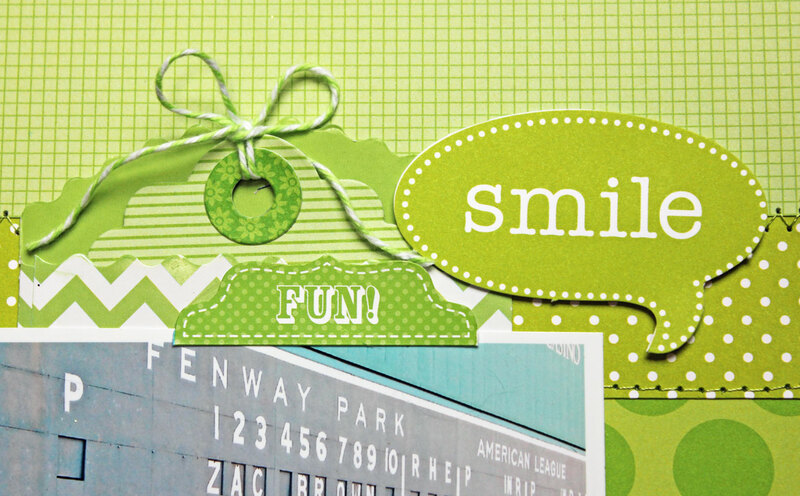 Hi Everyone, it's Kathy today with my take on Doodlebug's Design by Color Challenge. The Design Team was asked to pick one color from the Doodlebug palette and create a layout/project/card that was at least 75% that color. It was a hard choice (I love ALL Doodlebug colors...) but I chose Limeade. And as luck would have it, I had the perfect picture to complement my color choice! I added a Limeade Chevron Treat bag to hold a hidden journaling tag which is embellished with some Limeade Doodle Twine. I had a fun time going through all my Doodlebug goodies looking for more Limeade! I found some stickers from the Kraft in Color Collection, some Limeade Fancy Frills, and a couple of Stickers from the Day to Day Collection. Best of all, I found this ADORABLE Monster Doodle pop in my stash from the Monster Mania release!!! He was the perfect addition!! To complete my layout I added some Limeade Shin-dig Sugar Coated alphas, mixed with some Limeade Teensy Type letters for my title. This was a really fun layout to create...I had a great time figuring out how to make it all work! That's it for me today, make sure to keep coming back to see more inspiring project from the design team! Thanks for stopping by! 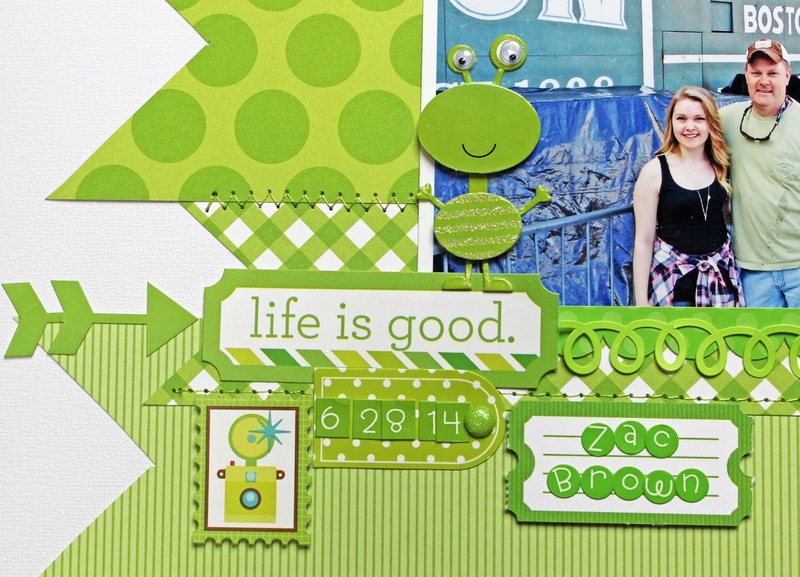 Loving your Limeade layout Kathy, COOL banners, GORGEOUS greens and a splash of sparkle too - LOVE IT ALL :) It really makes the blue of your photo POP - how wonderful that your family followed your instructions and got the perfect shot for your page too. The shades of green work well together. Not usually my shade of choice - but I could use this. Great layout. Oh I usually stay away from green but i love this!! OMG what an awesome LO. You really did do one outstanding creative job WOW!! I know there's nothing better than the perfect pic for a LO!! 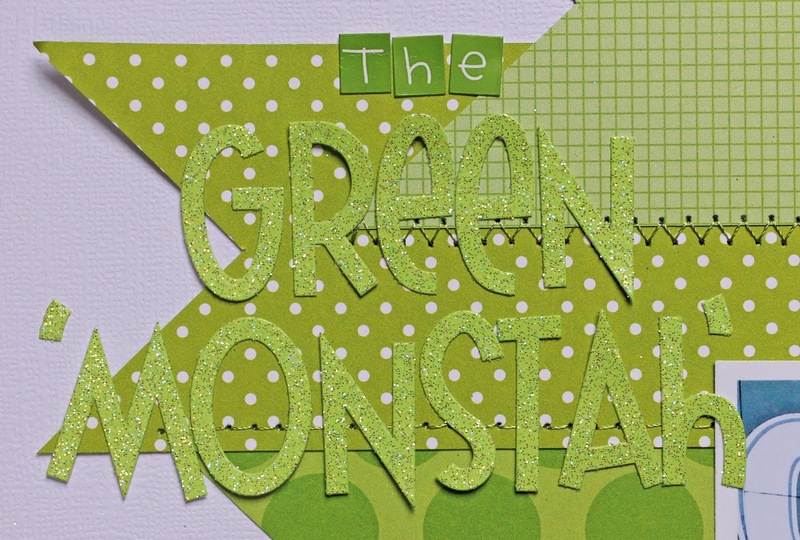 I just love the colors, papers and your machine stitching.....you really are on very talented scrapper. So glad you shared. I'm a die hard scrapper in my 10th year and love seeing how other scrap and the inspiration that come with it. YOU so ROCK!! This is so FAB!!!! Love what you did with the horizontal strips on your layout, the stitching really adds to it, and it is full of really fun details!! Way to go - It is awesome!! Love this my friend. So glad they had a blast.